Adeline was born January 21, 2009. We thought she was slightly jaundiced, but took her home assuming it would clear on it's own. Little did we know the road that lay ahead. A month later we found ourselves at the hospital, handing our sweet, petite baby girl over to a surgeon because of a life threatening liver disease ... Biliary Atresia. The first 2 years of Adeline's life were spent in and out of the children's hospital. Infections, bleeding varices and uncontrollable fevers consumed our lives. Eventually, as time passed, it became our new "normal". As Adeline grew, her health improved. She finally began to gain weight. She started meeting milestones. Adeline started school and was a superb student. Life began to feel comfortable. 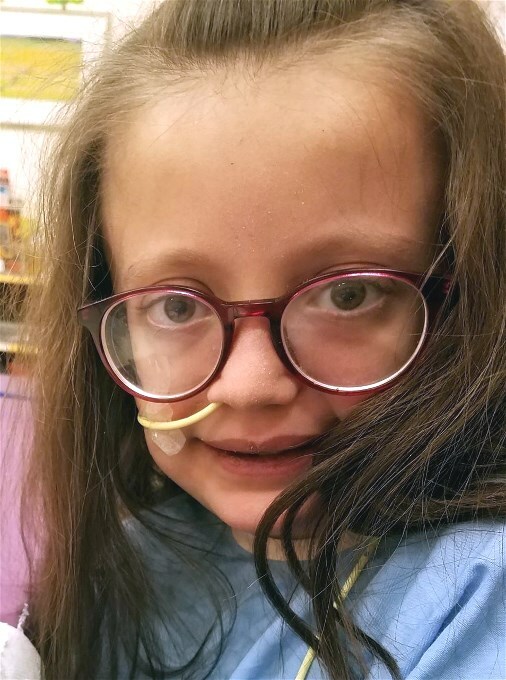 Last year Adeline's liver disease reminded us how unpredictable life can be. She has been in and out of the hospital for weeks at a time. She is so brave through it all. In July she was listed for a Liver Transplant. We are currently patiently waiting for the call that will hopefully save her life. UPDATE: Adeline received her new liver on November 30th. The initial hospitalization was 29 days. Since then she has been back to the hospital and the OR for procedures related to obstructions, etc. She was most recently released on January 30th.